This is an amazing book that I just reread. It's a about a British woman working on a film shoot in Kenya who decides to drive to Ethiopia. She ends up in horrible situations with no transport, food or water. But she carries on. The writer must have experienced this trip herself because it is so real. It's a gripping story and I couldn't put it down. Having read Cody's detective novels, I was curious about her stand alone novel. While billed as a crime/mystery, it is more a horror travelogue about trying to travel in Ethiopia with maps that misrepresent, unsavory travel companions, drought, famine, ticks, lice, heat, armed insurrection, etc. Among her observations is that she wanted to see attractions of the Rift valley, but she, as a foreigner, become the main attraction of the villagers. The children are relentless; the only refuge is the squalor of a room shared with vermin. Yikes! I turned on my faucet with hot water with a new appreciation. Ugh--not at all up to Cody's usual. Vacuous protagonist, almost xenophobic in it's vicious portrayal of Ethiopia/Africa. And then nothing actually happens throughout the book. Perhaps it's something she just had to get off her chest, but quite a disappointment. Really good read, and you'll learn a bit about Ethiopia and poverty along the way. Adventure story in the Rift valley of Ethiopia. 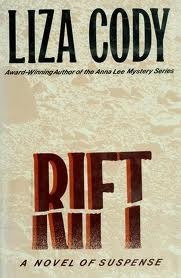 Liza Cody - Liza Cody (real name Liza Nassim) is an English crime fiction writer.